Our understanding of the ways the Old and New Testament relate to one another have a host of theological, pastoral, and practical implications. Too many Christians settle for a rudimentary understanding of their continuity and discontinuity. Jason Meyer is not one of those individuals. 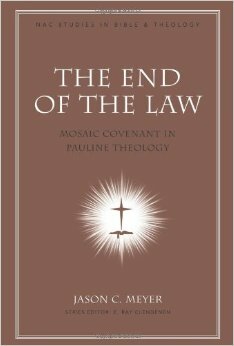 In The End of the Law he gives readers a fresh, thorough, and clear articulation of the relationship between the Old and New Covenants. With impressive detail and clarity he walks readers through the leading New Testament texts which deal with this subject. This includes 2 Corinthians 3-4, Galatians 3-4, and Romans 9-11. His attention to detail is impressive as he walks us through these chapters, sometimes with more detail than even some respected commentaries. While readers may get bogged down in these parts, it is worth every effort to work through them carefully. For here is where not only the bulk of Meyer’s thesis is articulated and defended, but here is where the real insights and beauty of his thesis shine clearest. This distinction has determinative effects. The old age is transitory and impotent, and therefore the Mosaic covenant is both transitory and ineffectual. The new covenant is both eternal and effectual because it belongs to the new age and partakes of the power of the new age, the Holy Spirit (2). While this way of defining the difference is not unique to Meyer, and he points to other authors who have drawn similar conclusions, he does present some fresh perspectives on the idea. In particular Meyer goes beyond mere word studies. Following the lead of Stanley Porter, Meyer finds the idea of covenant reaching far beyond the mere presence of the word in select texts. Meyer unpacks for readers a host of associations between covenant and other concepts in the Scriptures. So he finds that in Pauline language the New Covenant is associated with concepts like Spirit, life, life, righteousness, heart, freedom, glory, promise, and gospel. The Old Covenant, in turn, is associated with concepts like letter, stone tablets, condemnation, abolish, slavery, law, curse, and death. This way of looking at the two covenants continues to highlight Paul’s theology and approach and expands the points of reference for this debate. In this way Meyer offers some fresh perspective on the subject. While readers may not agree with all Meyer’s interpretive decisions, the attention to detail and comprehensive exegetical work is hard to argue with. It is definitely an academic work. Readers with less familiarity with the scholarly discussion may struggle to get through the book, but those willing to do the hard work will find a wealth of insights in this monograph. His concluding chapter seeks to apply these insights immediately to the practical realms of ecclesiology and ethics. Thus, while most of the work deals in providing a comprehensive exegetical and theological foundation for Biblical theology, Meyer understands the importance of this issue for Christian living. The way we view the relationship between the Old and New Testament is extremely important, The End of the Law is one tremendously helpful resource for better understanding that relationship. I highly recommend this book.